Kirunal is processed using Supercritical Fluid Extraction (SFE), a process utilizing carbon dioxide (CO2) to fine tune temperature and pressure while extracting the delicate polyunsaturated oil from fish. SFE prevents the degradation of fish oil by heat and oxygen, insuring the highest quality and concentration of EPA and DHA in each 500mg softgel. 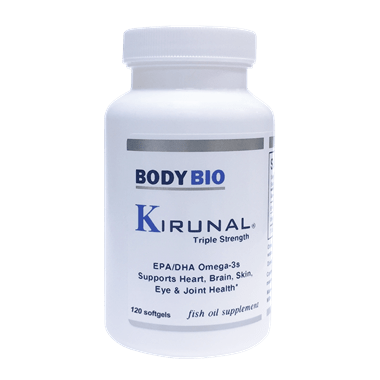 Dr. David Horrobin’s research formulation of high EPA Fish Oil.Kirunal is now processed using Supercritical Fluid Extraction (SFE), a process utilizing carbon dioxide (CO2) to fine tune temperature and pressure while extracting the delicate polyunsaturated oil from fish. SFE prevents the degradation of fish oil by heat and oxygen, insuring the highest quality and concentration with 420mg of EPA/DHA in each 500mg softgel. Other Ingredients: Fish body oil, gelatin, glycerine, water, and mixed tocopherols. SUGGESTED USE: Adults take 1 softgel twice daily. BodyBio’s Omega 3 Fish Oil has been developed to provide the brain with specific nutrients it needs to function properly. 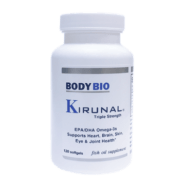 Each Kirunal softgel contains 500 mg of specially selected fish oil that provides three times more EPA (eicosapentaenoic acid) than DHA (docahexaenoic acid).